Geophysicist Professor Boris Kaus of Johannes Gutenberg University Mainz (JGU) has received grant money from the European Union to improve the exploration of crude oil and natural gas in the vicinity of salt deposits. This grant will support the joined work of Kaus's group and industrial partners testing new methods in sedimentary basins where salt is present and demonstrate their economic feasibility and cost-reducing potential. The funding is a Proof of Concept Grant from the European Research Council (ERC) in the amount of EUR 150,000 and is intended to make discoveries in basic research available for use as quickly as possible. Many of the global oil and gas reserves are located near salt rock layers in sedimentary basins. Because salt is a low density and soft rock, it can flow on geological timescales, i.e., millions of years, and form large scale salt structures severely deforming neighboring sediment layers. This poses various challenges to the oil and gas industry. "On the one hand, we have to reconstruct how the sediment basin has developed over time in order to understand where exactly hydrocarbons were formed, how they have migrated, and where they are located today," said Kaus, explaining one of the problems when locating new oil and gas deposits. The existing methods for geological reconstruction are less suitable for areas with salt tectonics, because salt flows in a 3-D manner over large distances. In addition, drilling can be risky, because salt structures disrupt the stress conditions in the sediment basin. This can cause drill holes to collapse or cause other costly delays. "We are therefore proposing a radically different technology to accompany and support oil exploration," added Kaus. In this, advanced computer simulations of the sediment basin are combined with any already available data. "Our methods can reconstruct the geological development of the basin in a physically consistent manner, even if it is severely affected by salt tectonics." The geophysicist from the JGU Institute of Geosciences also notes that these methods contribute to making the conceptual design of future drilling campaigns safer and more efficient, which is a factor that is very important for companies considering currently low oil prices. Kaus's work group at Mainz University will collaborate on the project "Salt Tectonics and Dynamics" (SALTED) with industry partners to be able to test the new methods in the real world. "My research group primarily focuses on fundamental questions regarding the function of plate tectonics. Thanks to the ERC Proof of Concept Grant, we can show how basic research can also be interesting for industrial applications," said Kaus. The researcher has recently received EU support for two new doctoral positions within the framework of the international doctoral candidate network CREEP. Previously, he was granted an ERC Starting Grant in 2010. The European Research Council (ERC) launched the Proof of Concept Grant program in 2011. It is available only to those researchers who have already received an ERC Grant and would like to continue work on the concept developed during the initial project in order to transform it into a viable innovation. 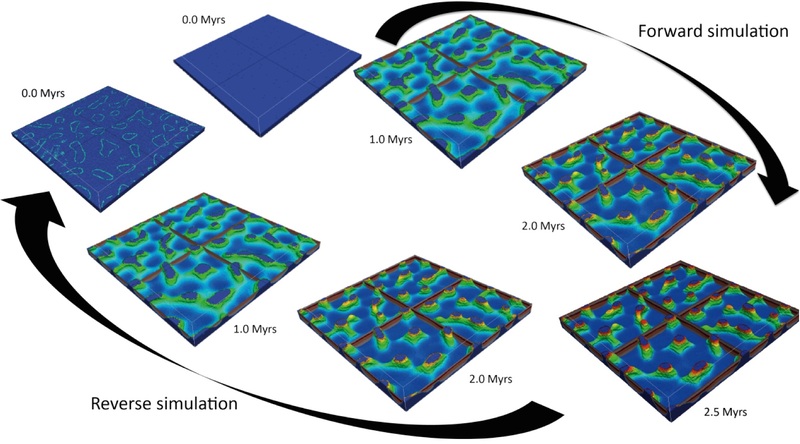 Numeric simulation of salt tectonics: the upper row of images shows a temporal forward simulation that starts with a salt layer, on top of which sediments are gradually deposited. Because salt is lighter than the overlying sediment, the salt rises to the top and forms salt structures, which are similar to the structures observed today in sediment basins. The bottom row of images shows that in the simulations it is possible to start with the observed structures and calculate back in time. The complete evolution of a sediment basin can thus be reconstructed.